Animal Wellness is a holistic full service veterinary clinic. 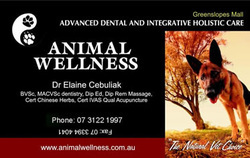 Dr Elaine Cebuliak is a qualified holistic Veterinarian with a special interest in advanced dentistry (including root canals), muscle therapy, acupuncture, palliative cancer care, Western herbal and Chinese herbal medicine. 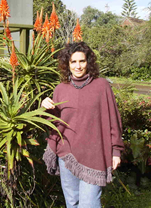 Elaine performs referral work, teaching, running workshops and locums under the business name “Animal Wellness”. 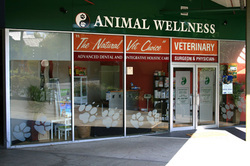 Animal Wellness is located at the Greenslopes Shopping Mall, ground level, Brisbane Queensland.